An eminent economist and social thinker explains his views on why traditional environmental and resource economics has not met the needs of the developing world. The gaps between haves and have-nots are so great, says Partha Dasgupta, that many premises of our analyses are mistaken or irrelevant in other international contexts. Thus, 'the environmental economics to be found in the literature in the North cannot much resonate in the South.' This breach helps explain the exclusion of environmental concerns from economic modeling in poor nations, causing problematic gaps in development economics, in understanding poverty, and in understanding what is, for some populations, a deepening economic and environmental peril. The author establishes important connections between poverty, high fertility, and malnourishment -- and environmental damage and civic disconnection. For example, communal ownership of resurces is common in poor rural areas. Democratic decisionmaking and self-determination could result in more careful use of resources, yet democracy is too rarely found in these areas. Also, high birthrates., resulting from several cultural and economic factors, lock communities in the grip of poverty and resource degradation. 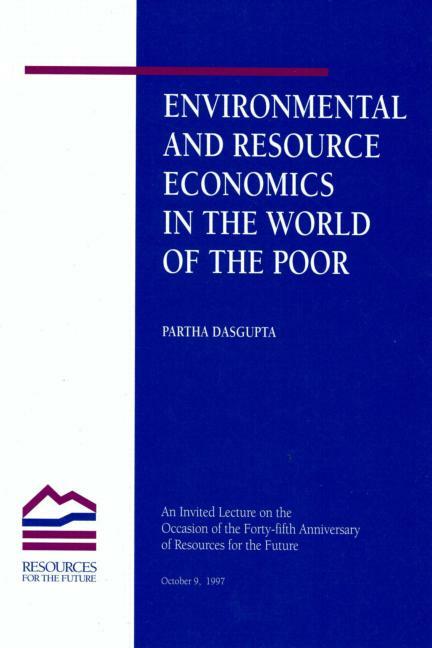 In assessing the interrelationships of these factors, Dasgupta makes a thoughtful contribution to development economics, environmental/resource economics, and our sociopolitical understanding of poverty. Partha Dasgupta is the Frank Ramsey Professor of Economics at the University of Cambridge as well as a University Fellow at Resources for the Future. He is the author of An Inquiry into Well-Being and Destitution.